Sarah Jacobs/Business InsiderRent the Runway CEO and co-founder Jenn Hyman. Rent the Runway, a fashion company that allows customers to rent and return designer clothing, recently received a $US20 million investment from Blue Pool Capital, an investment firm created by Alibaba founders Jack Ma and Joe Tsai. Rent the Runway is reported to be valued now at around $US800 million. 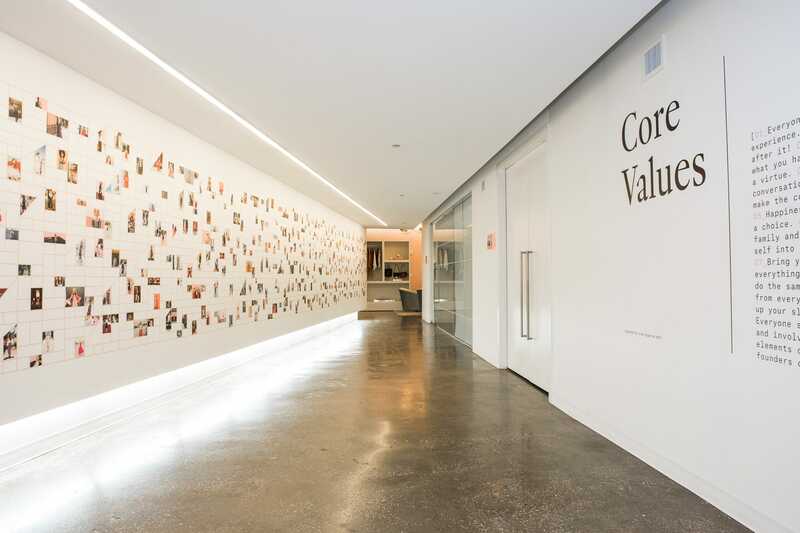 Last year, Rent the Runway renovated its New York City headquarters, and Business Insider got a look inside. Rent the Runway has been working to democratize fashion since 2009. 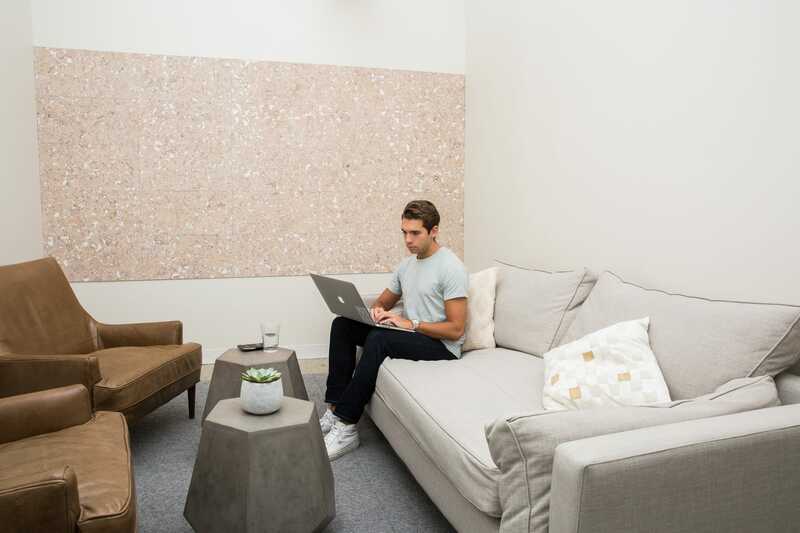 The startup allows customers to rent articles of clothing from more than 450 designers, with tiered monthly subscription services and items that start at $US30 for a four-day rental. Last week, it was reported that Jack Ma and Joe Tsai of Alibaba invested $US20 million in Rent the Runway through their asset management firm, Blue Pool Capital. With that investment the company is now reportedly valued at a little less $US800 million. Late last year, Rent the Runway celebrated its eighth anniversary with the opening of a freshly renovated Manhattan headquarters. 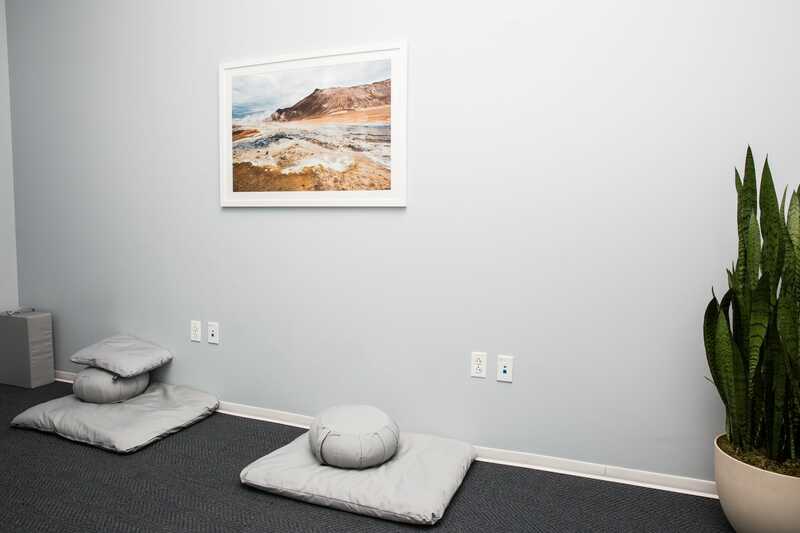 The nearly 40,000-square-foot space, which was designed by Hyphen, is adorned in pink wallpaper, and its perks include a meditation room, photo studio, and fitting room for employees to change into their own rentals. “Even though we’re 1,200 people it still feels like it did in the early days when we first founded the company,” co-founder and CEO Jenn Hyman told Business Insider. Ahead, get a look around the office and Hyman’s favourite spaces. The offices house around 250 employees, though Rent the Runway employs about 1,200 people in total, including in their stores and warehouses. 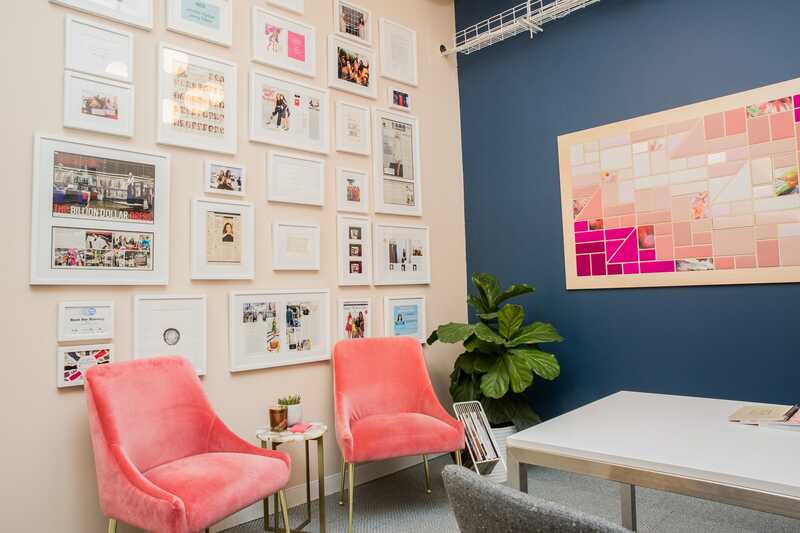 On the left wall is what Hyman calls her favourite thing in the office: photos of customers, employees both past and present, and other female entrepreneurs that have used Rent the Runway’s services. 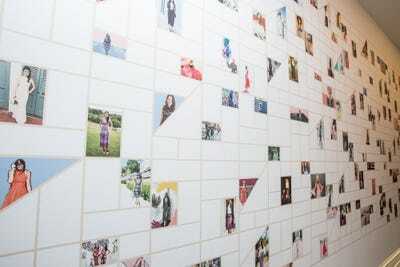 “These are amongst the millions of photos we’ve received over the past eight years from women all over the country. That’s what has inspired us to keep growing and keep building this company — it’s these women, and how renting the runway makes them feel,” she said. 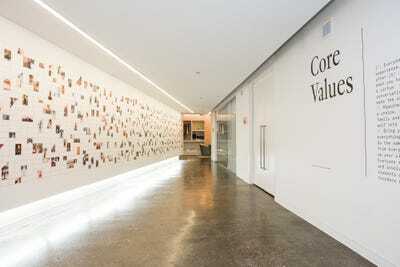 The company’s core values, which were written in 2010, are still very much a part of their identity. 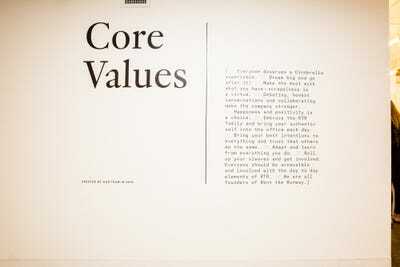 “Our [office] culture [is] encapsulated into these values. We’ve prioritised hiring for culture above hiring for skills. We find that you can always teach people skills — especially smart, curious people who want to learn,” Hyman said. Each conference room has a different look and feel. “Sometimes, you feel totally revved up and you want to throw your ideas up on the wall. Sometimes you just need a quiet space for you and your laptop to think. Every single room has its own purpose,” Hyman said. 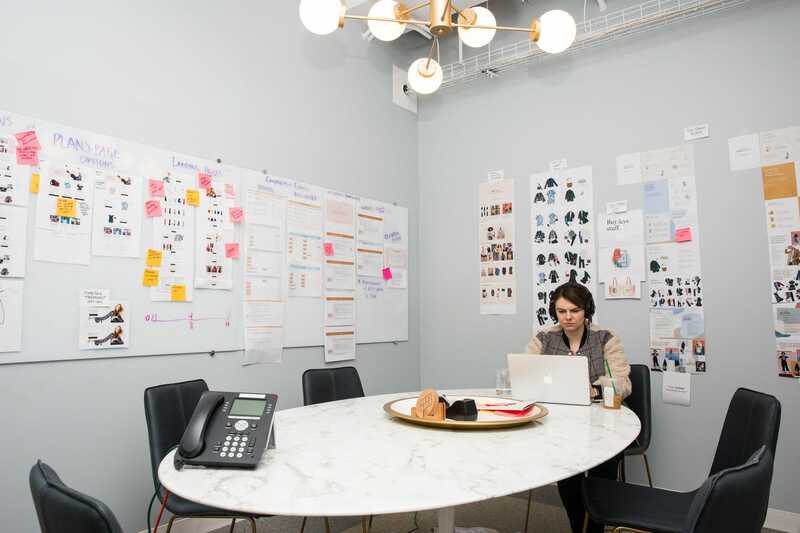 “This is one of my favourite conference rooms. Since most of my day involves collaborating with team members, I’m always in meetings with many people and debating different ideas. 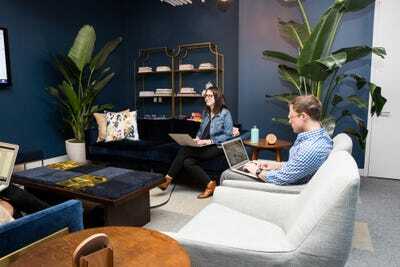 This is the perfect setting because everyone’s in a circle, you’re all on equal footing, it doesn’t feel like it’s formal — you can relax,” Hyman said. This small meeting room has two hanging seats to relax in. Every piece of merchandise that’s on the site is photographed in-house. 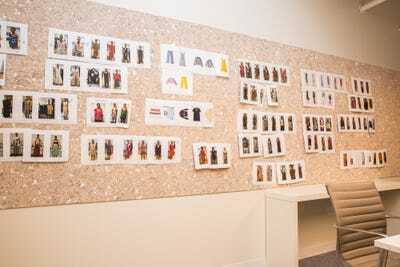 “We want to visually pin everything up and figure out how we should actually build our collections,” Hyman said. Merchandise is prepped and shot in the in-house photo studio. Everything from dresses to hand bags to jewellery are kept there. All-hands meetings are held in this communal space. 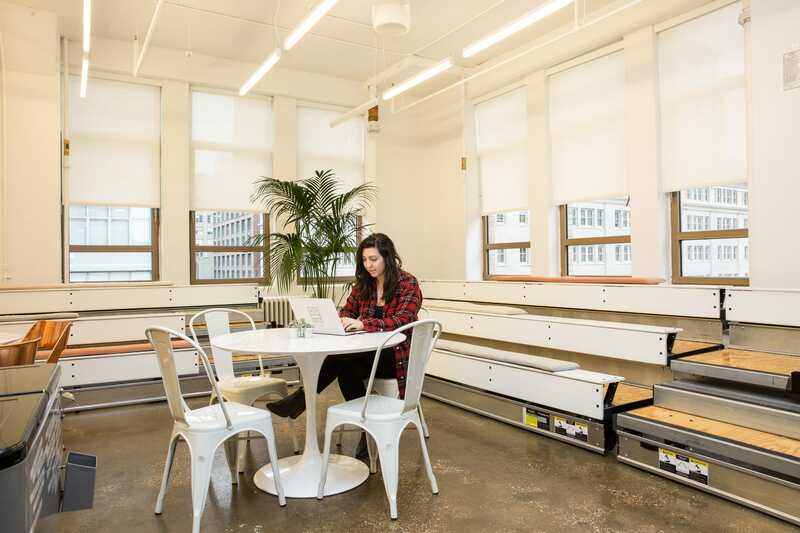 The bleachers allow for the entire office to sit comfortably. 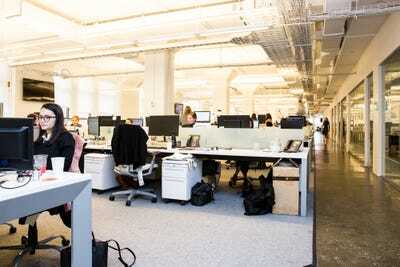 Desks are in an open-floor seating arrangement, and employees switch desk locations about every six months. This allows everyone to meet new colleagues and produce fresh ideas, according to Hyman. 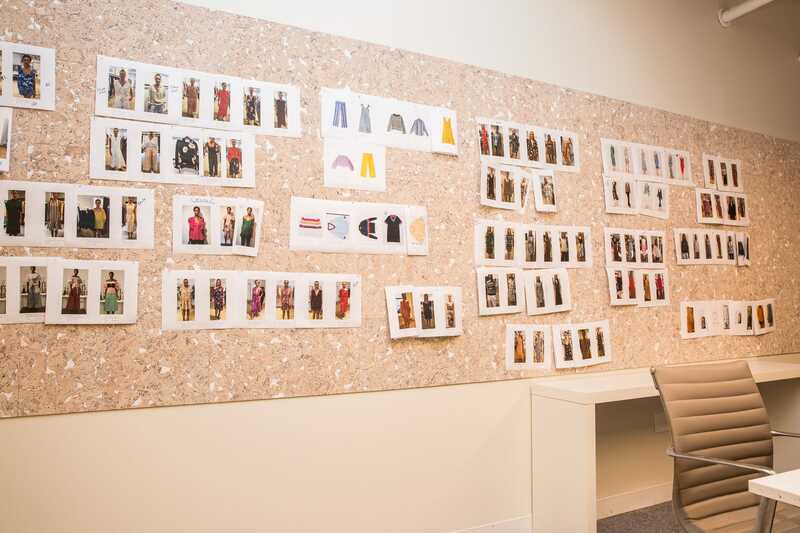 Inside Hyman’s office is a small closet and mirror for wardrobe changes, as well as a piece of art that’s made of fabric from retired Rent the Runway dresses. Hyman also has her favourite company memories framed, from their first reserved front-row seats at a fashion show to a photo of Beyoncé, commemorating when the singer called, wanting to be Rent the Runway’s celebrity spokesperson. “It didn’t end up coming to pass, but the fact that we got a phone call from Beyoncé was one of the highlights of building Rent the Runway,” Hyman said. There’s also a proper fitting room that’s available for the entire office to use. It’s located just down the hall. A designated meditation room provides employees with a space to collect their thoughts. 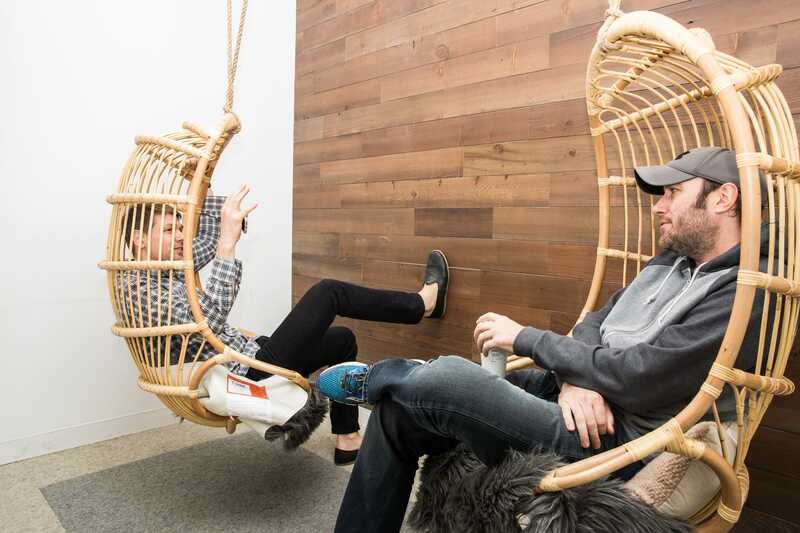 “Everything is meant to feel light, airy, collaborative, and welcoming,” Hyman said.